As a parent, your major concern is to keep your children safe from harm, both inside and outside of the home. Children face a variety of dangers indoors, from choking hazards to poisonous substances stored under the sink or in medicine cabinets to injuries sustained from falls, burns and electric shocks. On average every day in the United States, 7 children are injured from unprotected wall sockets according to the Electrical Safety Foundation International. Equally alarming, in 70% of these cases, the parents are in the home when these injuries occur (U.S. Consumer Product Safety Division).Certainly, these statistics are cause for concern for parents of young children, but fortunately, there are simple, proactive steps parents can take to protect their children. 1. Look at your home from your child’s point of view: the first thing parents can do is to simply realize that children are at greater risk because they haven’t yet learned how to avoid dangerous situations. That means parents have to look at their homes from their child’s point of view. It is sometimes useful to actually crawl rather than walk through your home to identify dangers you might not otherwise see. 2. Begin the educational process as soon as your child can crawl: you can’t expect a toddler to understand a complicated explanation for why he or she shouldn’t put a finger in an electrical outlet or pull plugs out of the wall, but if you gently but firmly tell him or her “no” when you see a dangerous situation, and then provide a nice reward for doing the right thing, you’ll go a long way to making your child understand what’s acceptable, and what’s not. You should continue this education throughout your child’s early years. 3. Secure and maintain all electrical appliances: most electrical injuries are the result of accidents with small and large appliances and power tools. Check to make sure that cords on kitchen appliances and lamps (throughout the home) are not frayed and don’t show any signs of wear or tear. Whenever you see a frayed or damaged electrical cord, get rid of it immediately. Take special care with extension cords that can easily be pulled apart. Check all wall outlets on a regular basis to make sure there are no cracks or signs of breakage. If there is a short in any lamp or appliance, throw it out and replace it. 4. Childproof wall outlets with outlet covers and GFCIs: you have to put outlet covers on every outlet that isn’t being used. In addition, you should install Ground Fault Circuit Interrupters (CFCIs) for every outlet in your home. The CFCI can measure how much electricity is flowing from an open source and shut down (or “interrupt”) the electrical flow if it detects an electrical surge, or if water gets on the appliance. CFCIs are very sensitive and will shut down electrical flow when even minor problems occur. 5. Check all appliances, cords and CFCIs on a regular basis, and especially following an electrical storm: the U.S. government recommends that you conduct regular tests of all electrical appliances and CFGIs at least once a month, and immediately following an electrical storm (according to government studies, more than half of all parents who use GFCIs don’t test them regularly). Make sure that lights work properly and that appliances perform as intended. Because GFCIs are your first line of defense, you have to check these properly, and they’re easy to test. Simply plug any electrical device into the wall socket and press the test button on the GFCI. If the device is not working properly, you’ll hear a snapping sound. If the GFCI is working as it should, the electrical device will stop working. Once you know the CFGI is working as it should, press the reset button and the electrical device will come back on. 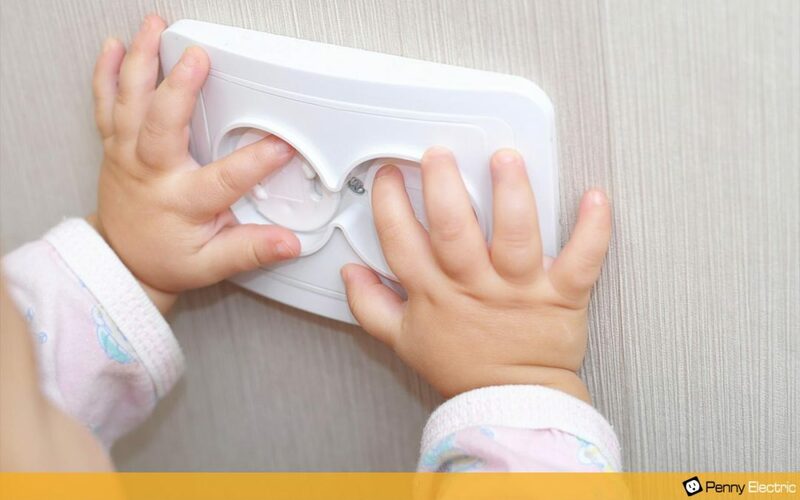 The good news is that childproofing your home from electrical hazards is easy to do, and inexpensive. You can pick up GFCIs for about $10 each, and electrical outlet covers for about the same amount, and you would probably want to replace appliances that aren’t functioning properly anyway. If you have questions about the wiring in your home or want to do troubleshooting to make sure your home is safe for your children, contact us today.